Citrus curd is one of those things that brings me absolute joy to make. 4 ingredients combined to make something so simple and beautiful. Patience isn’t really my thing – and Lord knows manual labor isn’t – but there’s something about the whole custard process and 10 minutes of whisking that I find very fulfilling. And then quite filling. 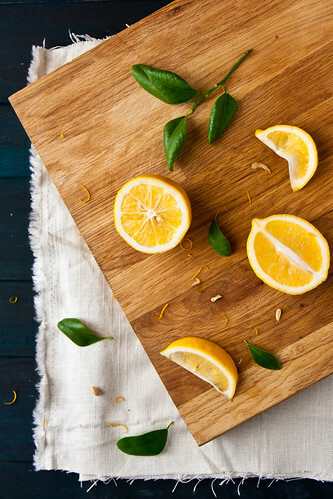 Meyer lemons aren’t as tart as “normal” lemons. This isn’t the lemon I put in my sweet tea. This isn’t the lemon I crack open for a tablespoon of juice in a recipe with a laundry list of ingredients. Meyers are special. They’re the lemons I use when the lemon is the star. I absolutely love this recipe. It’s unique in that it uses the whole egg. It’s also easily adaptable for other citrus curds – it makes a mean grapefruit and key lime curd. We actually have a dwarf Meyer Lemon Tree but if you can’t get your hands on Meyer lemons – they’ve actually just shown up in my grocery store – “normal” lemons work just fine! Its uses are almost limitless: spread it on toast, angel food cake, a cream scone, or use it to fill a white cake or a tart shell. The bright flavors can push those storm clouds away in a single bite. It really is something special. 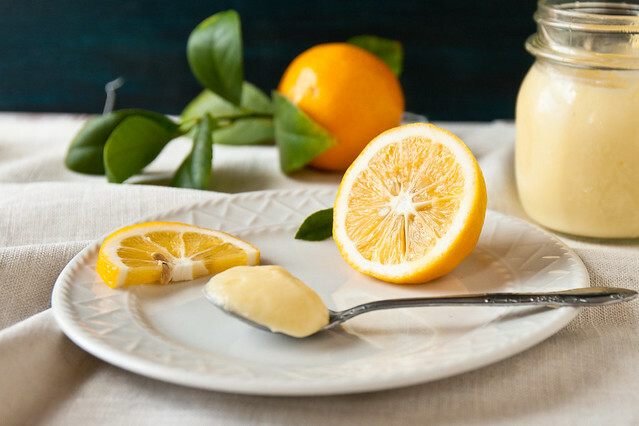 A lemon curd recipe that uses the whole egg! Its uses are almost limitless: spread it on toast, angel food cake, a cream scone, or use it to fill a white cake or a tart shell. Whisk the zest, juice, sugar, and eggs in a bowl set over a saucepan of simmering water. Add butter and whisk constantly, until thickened and smooth (a thermometer should read 160-170F). Strain curd through a fine sieve set over another bowl. Serve warm or cover surface of curd with plastic wrap and cool completely. Curd will keep over a week in the fridge in a jar. 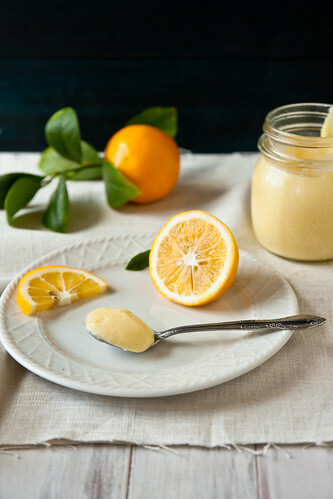 I love lemon curd and I’ve never seen a recipe that uses whole eggs before – I can’t wait to try it! Mmmm nothing quite like a lemon curd. Yum! I absolutely love this stuff as a cupcake filling! I made a lemon curd recipe a few weeks ago, similar to yours but with less butter and more heart-stopping yolks. It’s wonderful spread on biscuits! This year I get requests to make lemon curb for Holiday’s gifts. I have a recipe that I like but will try this one for a change. My brother-in-law loves it on crêpes. I fell completely head over heels for meyers last year…they’re like the really good extra virgin olive oil of the lemon world. You don’t use them for just anything! I love how curd really showcases their flavor…this sounds delicious! That’s an awesome way to describe them! This sounds absolutely heavenly girl! Yum! Lemon curd has been on my list for a while now. And, surprisingly, I’m able to find Meyers in my neck of the woods around Christmastime. Can’t wait to try this once they turn up! 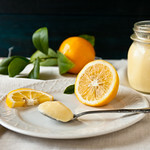 I have always wanted to make homemade lemon curd but been scared to try. You make it look easy can’t wait to try it. I made this from a friend’s lemons in Santa Cruz, CA, and passed the curd around to all my friends. The best compliment of all–to the recipe–was “don’t lose that recipe. …it’s THE best!”. I’m now making it with very different Meyer lemons imported from California to where I live in Canada, the small orange type. I think it’s all in the lemons–time will tell. But obviously this recipe has the right ratio of lemon to sugar, and is so easy to make, given the whole egg is used. I like not being left with a lot of egg whites.